It has been a funny old time for me lately, where life has impeded much more on my writing time than it has in the past couple of years. As a result, writing the latest in the Joe Hunter saga (No 10 working title: The Lawless Kind) felt different than when penning the previous books in the series. Anyone who knows me probably know also that I like to write from the seat of my pants and rip into the book with gusto. However, with life and all its little problems and connotations getting in the way, I wrote JH10 in fits and starts. I was grabbing time here and there, writing half a chapter here, half a chapter there, then a few days would go by, then another half a chapter and so on. It reminded me very much of what it was like when I was holding down a 'proper job' and only got to write during brief periods as and when I could. To be honest, it wasn't a nice feeling. But anyhow, that besides, the book is now finished and delivered to my editor, and initial reports are good indeed. But now I'm at that shaky place authors sometimes find themselves, where they don't know what to get on with next. In truth, I'm well ahead of the game with my Hunter books, but don't want to wallow and prefer to get on with the next. However I also have some other projects in mind that I'd like to get out of my system. My editor, with good intentions, suggested i should take a few moths off from writing and enjoy myself for a change. Good advice. Except I get my enjoyment from writing. No: I must write. I'm going to start throwing around a few ideas and see which one grabs me most. Don't know yet what it will be, but at heart I'm a thriller writer, so I bet my leanings go that-away. Ooo! 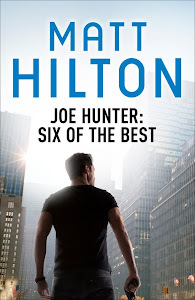 Will the new 'work' be an action thriller like the JH series - or will you take a different tack? Perhaps you could go back in time and pen a real Noir thriller dripping in 1930's/40's atmosphere or will you leap in your time machine and fast-forward to crime-solving in the future...? It'll definitely be a thriller. And to be honest, you might not be a million miles off the mark with your second suggestion.